Chetek-Weyerhaeuser High School students are showcasing their vast array of knowledge as they competed for the first time in the Wisconsin Academic Decathlon competition. Wisconsin Academic Decathlon (WIAD) is a non-profit, extracurricular, high school program. Fifty teams across the state advanced to Regionals, including the team from CWHS—entering the competition for the first time ever this year. They participated at the regional tournament on Friday, Jan. 11, at the University of Eau Claire-Barron County in Rice Lake. Each high school team consists of nine full-time students, specifically made up of three Honor (3.75 to 4.00 GPA) students, three Scholastic (3.00-3.74 GPA) students, and three Varsity (0-2.99 GPA) students. All nine students complete all of the tests, and the top two overall scores in each of those three categories comprise the team score. In this way, the program offers the appeal of mental competition to all achievement levels at a school. Decathletes must be enrolled as full-time students in the 9th – 12th grade in public or private high schools in Wisconsin. In addition to seven tests of knowledge at the Regional competition, students must also present both a prepared and impromptu speech, take part in a personal interview, and write an essay. Each category is worth 1,000 points, for a total of 10,000 possible points per competitor. Chetek-Weyerhaeuser was edged out from advancing to the state competition, short just 723 points from the next team who advanced. It was a very strong performance from all participants and was a great opportunity for students to compete academically as a team. 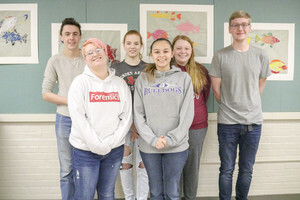 Front row, left to right: Makenna Watson-first place, Essay Honors; Kristina Roose-third place, Literature Scholastic; and second place, Essay Scholastic; back row: Aksel Maloney-second place, Science Varsity; Madison Bowe-third place, Interview Varsity; SevHannah Rahm-Jost-third place, Art Varsity; and Carson Hoff-third place, Math Scholastic.